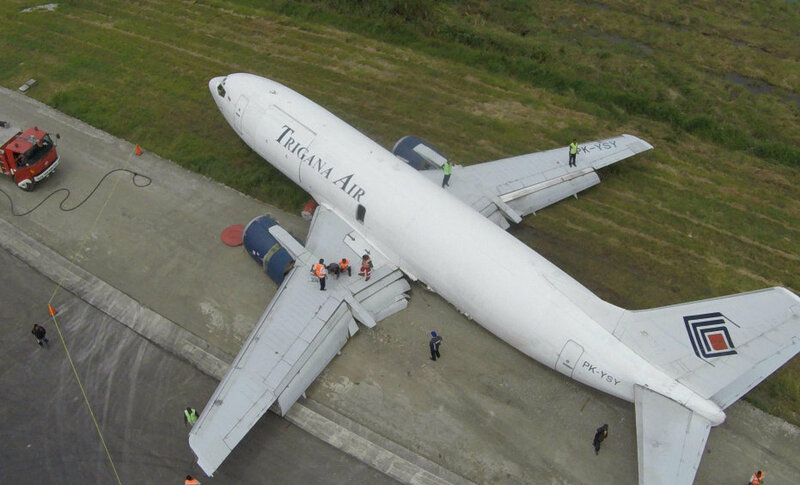 12 Sep 2016 - 737-300SF, PK-YSY (23597/1287), FF 24/9/1986, operated by Trigana Air Service suffered a landing accident on runway 33 at WAVV, Wamena, Indonesia. The aircraft was approaching the airport (Elev 5,084ft) in level flight at 5,600ft from a visual approach in a 400ft cloudbase. When the crew saw the airfield they pitched down sharply towards the runway generating a GPWS aural warning “SINK RATE”. The aircraft touched down with 3.25g vertical acceleration causing both MLG to collapse. The aircraft was carrying 14,913Kg rice and sugar belonging to Indonesian state energy firm Pertamina. The aircraft was airworthy prior to the occurrence and was operated within the weight and balance envelope. 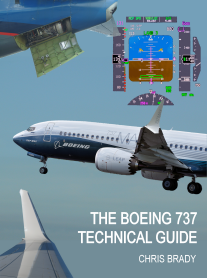 There was no report or record of the aircraft system abnormality during the flight from take-off until the time of the occurrence. All crew had valid licenses and medical certificates. Fifteen minutes before departure, the pilot received weather information of Wamena which was stated that on the right base runway 15, low cloud was observed with the cloud base was increasing from 200 to 1000 feet and the visibility was 3 km. The visibility of Wamena airport reported by BMKG at the time of the occurrence was 3 km. At altitude approximately 7,000 feet, the pilot received landing clearance from the Wamena tower controller, at this position, the pilot could not identify visual checkpoint. The PF reduced the rate of descend and continued the approach. The PM advised to go around. 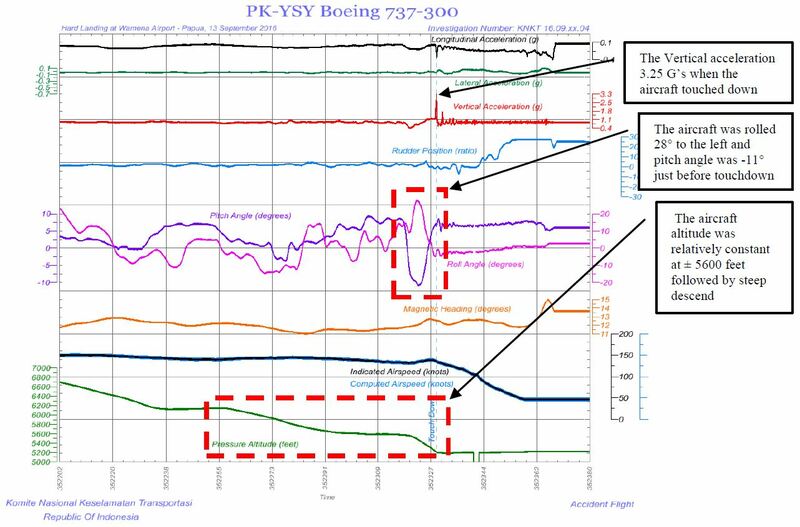 At altitude approximately 5,700 feet at about 2 Nm from runway threshold the PF was able to see the runway and increased the rate of descend. The Enhanced Ground Proximity Warning System (EGPWS) aural warning “SINK RATE” active and the PF reduced the rate of descent. While the aircraft passing threshold, the aircraft sunk and touched down at approximately 125 meter from the beginning runway 15. The FDR recorded the vertical acceleration was 3.25 g on touchdown. Both of main landings gear collapsed. The left main landing gear detached and found on runway. 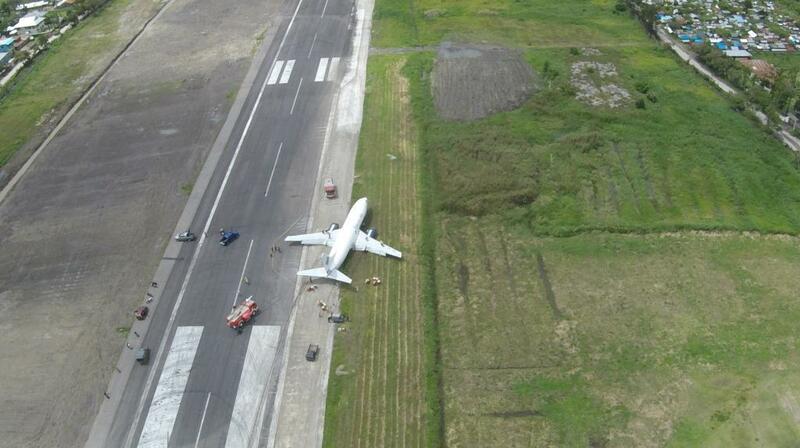 The engine and lower fuselage contacted to the runway surface. The aircraft veer to the right and stopped at approximately 1,890 meters from the beginning of the runway 15.